Why Earn a Bachelor’s Degree, 100% Online? Studies consistently prove the many benefits of pursuing higher education. From earning more money to enjoying more job security, online bachelor’s degrees can offer endless rewards. Here are some of the benefits of earning your bachelor’s degree online. 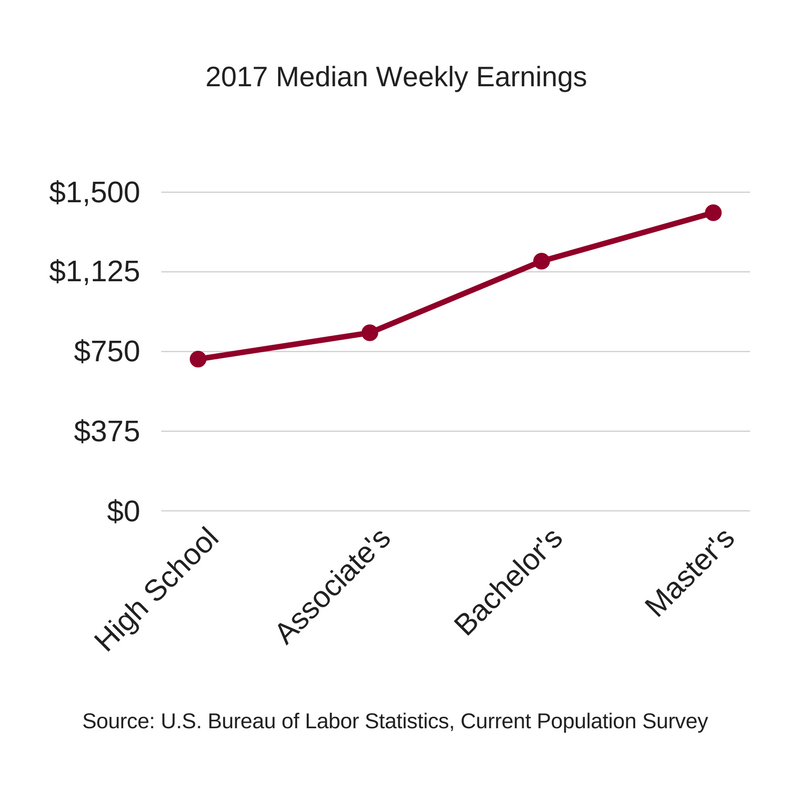 Professionals who hold a bachelor’s degree earn a higher median salary than those with less education, according to the Bureau of Labor Statistics (BLS). Having a postsecondary education is steadily becoming a requirement, not a preference, for getting a job. According to the BLS, 37% of jobs as of May 2016 required a postsecondary education. The largest percentage of those, 21%, required a bachelor’s degree. A report by Georgetown University found that by 2020, 65% of jobs will require a postsecondary education, with 35% requiring a bachelor’s degree at the minimum. 23% growth rate between 2016 and 2026, the BLS reports. Salary potential and employment opportunities vary depending on specific job duties, industry, candidate’s education and experience and job market around the country. Accreditation: Completing an online degree program requires a significant commitment. You want to be sure your time and effort is well spent earning a degree that will be respected in your industry and valued by potential employers. Regionally accredited universities have undergone an exhaustive evaluation to ensure they offer a certain standard of quality education. Not only will employers recognize online bachelor’s degrees from an accredited university, your credits are much more likely to transfer and you’ll be eligible to pursue a graduate degree if you so choose. Click here to read more about the benefits of earning your degree from an accredited university. For-profit vs. Nonprofit: For-profit universities are run like a business, and because they are seeking a profit, they often have a less selective admissions process. Their loans are generally at a higher interest rate than non-profit universities. Non-profit universities use the money they receive from tuition costs to fund the school. They are government funded and operate to ensure student successes by offering programs that support students and faculty. Because they may be more reputed in the community, they can offer more job connections with employers seeking local students. Faculty: Since faculty bridge the gap between you and the knowledge you seek, it is essential that the faculty are top-notch from wherever you earn your bachelor’s degree. Consider not only the percentage of faculty who are tenured and hold the highest degree in their field, but also the extent of their research and which corporations and organizations they have worked for and consulted. Variety of programs offered: Having the program you want to study is, of course, a large factor in your decision to attend one university over another. Although widely known for educating NASA astronauts, Florida Tech is a recognized leader in a number of fields, including business, engineering, psychology and more. Online offerings span a variety of in-demand industries and are continually being expanded. Florida Tech’s online classroom is composed of innovative tools to ensure you receive a quality, collaborative education – on your time. Our bachelor’s degree programs, 100% online, do not require on-campus attendance or specific login times. Students can expect an engaging experience featuring interactive media including lecture videos, discussion boards and chat rooms that allow students to connect with faculty members and each other. Florida Tech is distinguished by top-notch educators, international scholars and world-class researchers. Faculty members are also industry practitioners, so they are in touch with the trends and research in their prospective fields. Students who earn an undergraduate degree from Florida Tech receive the same high-quality education and earn the same diploma as main-campus students and can even walk in their graduation ceremony. Take the first step toward earning your bachelor’s degree with Florida Tech’s online Quick Apply process.